With a ribbed body, and garter stitch front panel, this little sweater can be worn alone, or as a layer under or over another sweater for added warmth. It can be made in a sporty version with superwash worsted [at left], or a luxury version, with angora [shown below]. Using smaller needles, CO 48 sts. Row 1: [WS] Sl 1, p1, *k2, p2* repeat from * to last 2 sts, p1, k1. Row 2: [RS] Sl 1, k1, *p2, k2* to end. Repeat rows 1 and 2 until neck measures 1.5 inches, ending with a WS row. Change to larger needle. Row 1: ]RS]: Sl 1, k1, m1, work sts as they appear until 2 sts remain on L needle, m1, k2. Row 2: [WS]: Sl 1, p1, k1, work rib sts as they appear to last 3 sts, k1, p1, k1. Row 3: [RS]: Sl 1, k1 m1, k1, work rib sts as they appear to last 3 sts, k3. Row 4 [WS]: Sl 1, k2, work rib sts as they appear to last 4 sts, k2, p1, k1. Repeat m1 increase on each edge of RS rows as established 10 times, sl 1, and k last st to maintain selvedges. Continue to work the rib sts as established. When increases are complete you will have 70 sts. 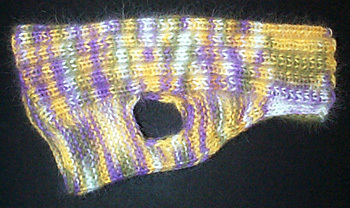 Work pattern as established until piece measures 4.5 inches from beginning, ending with a WS row. [RS] Sl 1, k6, BO 6 sts, work in rib as established to last 13sts, BO 6 sts, k to end. Work is now divided into three sections. [WS] Work each section separately, always sl first st and k last st on each section to establish/maintain selvedge. 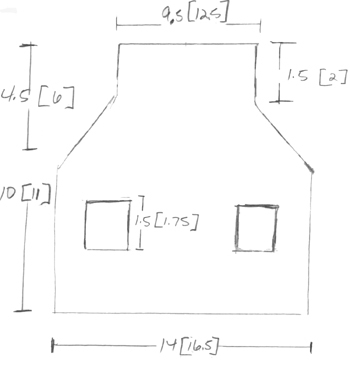 Work sts as they appear until each section measures 1.5[1.75] inches from BO edge, ending with WS row. Sections not being worked are held on the cable of the circular needle. [RS] Sl 1, k across first section, CO 5 sts, work sts across second section as they appear, CO 5sts, k to end. Continue to work sts as they appear until piece measures 10inches from beg. BO all sts as they appear. Sew together L and R edges to form tube. Corinne Niessner is the designer for Lucky Penny Hand Made, specializing in one-of-a-kind sweaters that celebrate her love for color, texture, and pets. 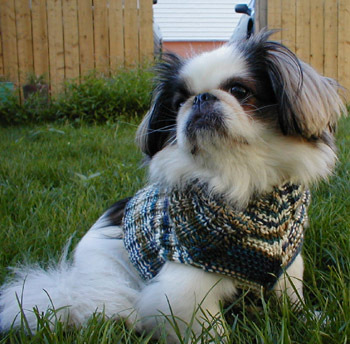 She lives in Chicago, IL, with her dogs Gidget Alice and Piccolo, who are the muses and road testers for the designs. The results of this collaboration can be found on Corinne's website.